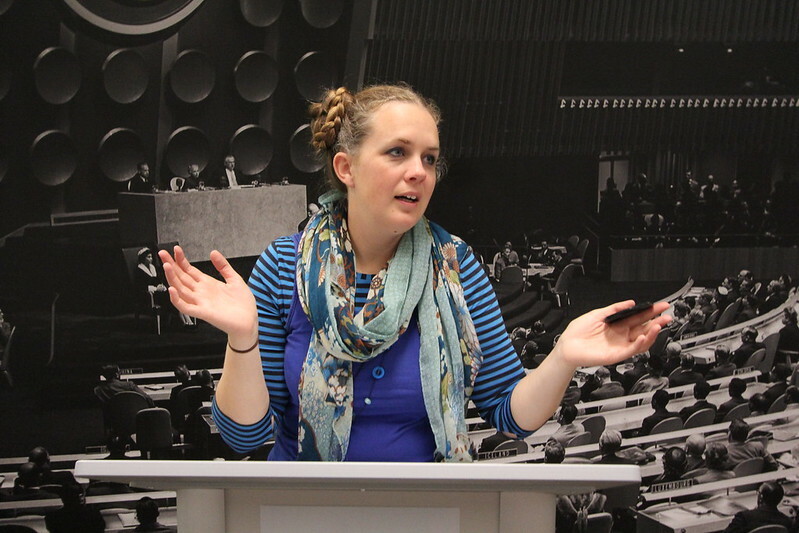 New York: Addressing (letters at) The United Nations! 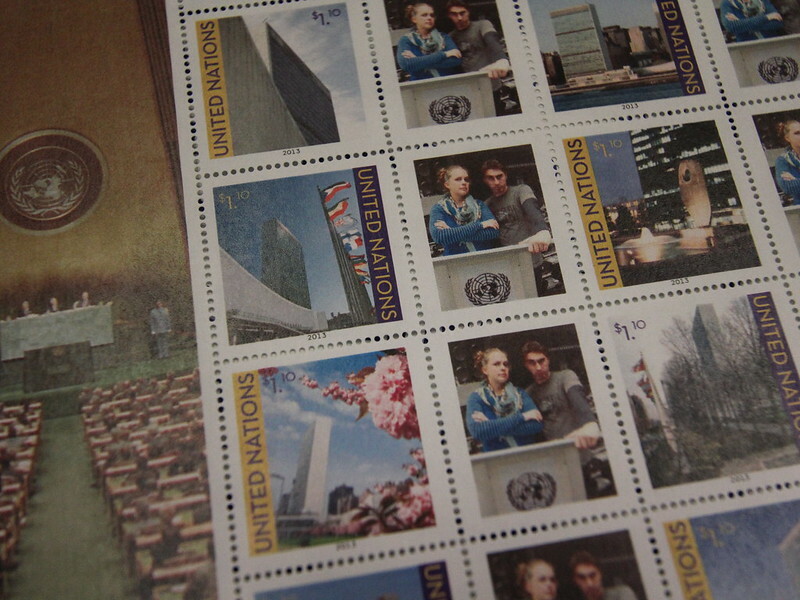 So we heard along a very short grapevine that it was possible to get one’s face on a real stamp at the United Nations. I’d been searching for something to do in New York that no one else I know had done. There’s a real feeling of accomplishment when you achieve something like this in a city where everything seems to be a tourist attraction. Our friend Sean had a friend who works at the UN and had lunch with her. It was there that he learned about this facility and then told us. So I made a few phone calls and Luke watched, not in the slightest bit interested. Eventually we worked out that the best time to go was on the weekend – otherwise you have to phone the internal post office from the UN gate and be escorted in if you don’t want to take the 40 minute tour. If you go on the weekend it’s no bother, just turn up at the 43rd street gate and tell the rather ominous security staff you’re there to go to the post office. When we got past the gate the whole place seemed deserted. It’s a big complex but there’s no one but security people around. The post office is downstairs and next to the gift shop. The guy who took our photo was extremely friendly and was happy to take as many photos as we liked to get the right one. Since Luke and I are masters of silly faces and expressions it didn’t take long. You have a choice of two backgrounds, one with the UN main room and another with the UN symbol. 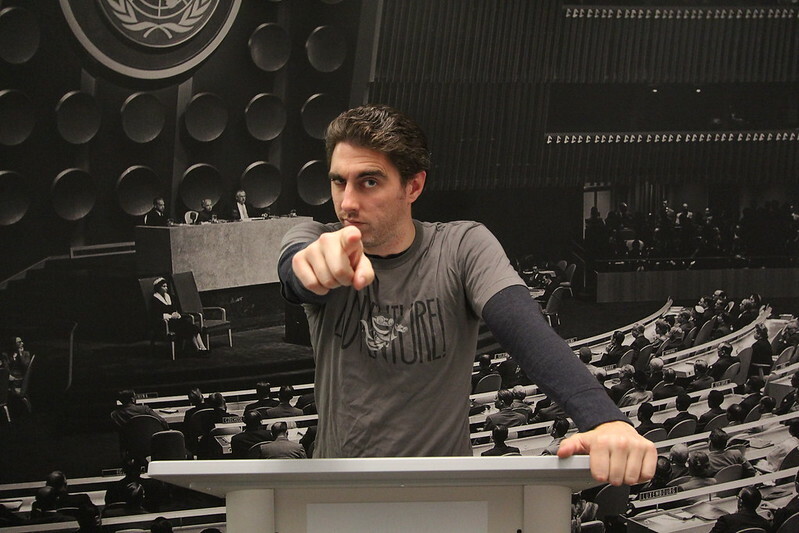 They take your photo in front of a podium so it looks totally legit. You get 10 stamps for $14.50. Probably one of the cheapest, easiest and fun things we did in our whole time there! Even Luke had to agree it was fun by the end. I got to represent Australia in the climate change debate since no one else turned up. Just be warned – you have to send your postcards from within the UN so come prepared with addresses of the people you’re planning on mailing to. Pretty sweet, I think you’ll agree. Awesome Amanda, I’ll keep that on my list!